NETWORK FINALS: DATELINE dropped 0.1 in final numbers. CABLE HIGHLIGHTS: The Saturday of Memorial Day weekend didn’t have much original programming, and it was dominated by TNT’s NBA PLAYOFFS game at 3.39. 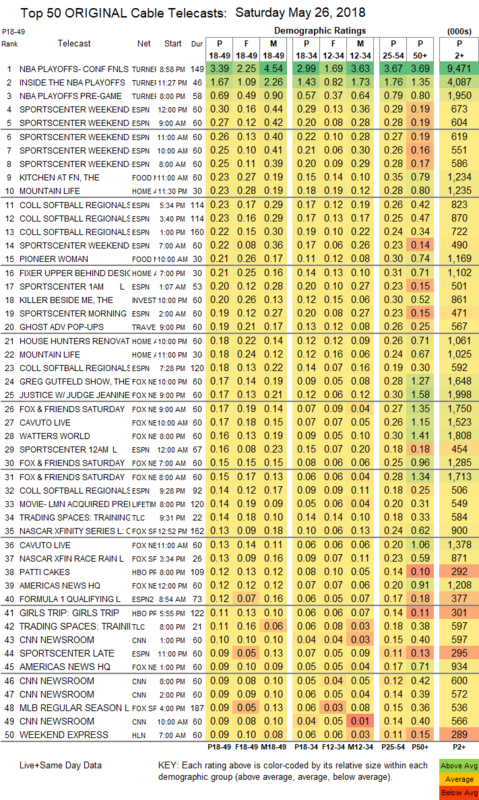 Assuming that the marathon of DINERS, DRIVE-INS & DIVES episodes was made up of reruns, the highest-rated non-sports show appears to have been Food Network’s KITCHEN AT FN, up 0.06 to 0.23, with PIONEER WOMAN at 0.22/0.21. ID’s THE KILLER BESIDE ME dipped 0.03 to 0.20. HGTV’s HOUSE HUNTER RENOVATION lost 0.03 to 0.18. HBO chose the night to premiere its Sundance film THE TALE at a lackluster 0.09, compared to last week’s 0.26 for FAHRENHEIT 451. On OWN, SWEETIE PIES ticked down to 0.08, and BLACK LOVE was also down a tick to 0.07. The night was so low-rated that Showtime’s PATRICK MELROSE made the chart, up 0.01 to 0.04.